Below is a list of hotels and inns around "Nagpur"
Set in a prime location of Nagpur, The Pride Nagpur Hotel puts everything the city has to offer just outside your doorstep. Featuring a complete list of amenities, guests will find their stay at the property a comfortable one. Facilities like 24-hour room service, facilities for disabled guests, Wi-Fi in public areas, valet parking, car park are readily available for you to enjoy. All rooms are designed and decorated to make guests feel right at home, and some rooms come with television LCD/plasma screen, separate living room, internet access – wireless, non smoking rooms, air conditioning. To enhance guests' stay, the hotel offers recreational facilities such as hot tub, fitness center, sauna, outdoor pool, spa. No matter what your reasons are for visiting Nagpur, The Pride Nagpur Hotel will make you feel instantly at home. Stop at Hotel Airport Centre Point to discover the wonders of Nagpur. Offering a variety of facilities and services, the hotel provides all you need for a good night's sleep. Take advantage of the hotel's free Wi-Fi in all rooms, 24-hour front desk, luggage storage, valet parking, car park. Some of the well-appointed guestrooms feature air conditioning, desk, mini bar, telephone, fan. Recuperate from a full day of sightseeing in the comfort of your room or take advantage of the hotel's recreational facilities, including garden, karaoke. Hotel Airport Centre Point is an excellent choice from which to explore Nagpur or to simply relax and rejuvenate. Located in Sitabuldi, Hotel Hardeo is a perfect starting point from which to explore Nagpur. Featuring a complete list of amenities, guests will find their stay at the property a comfortable one. Free Wi-Fi in all rooms, 24-hour front desk, 24-hour room service, Wi-Fi in public areas, valet parking are on the list of things guests can enjoy. Television LCD/plasma screen, internet access – wireless, internet access – wireless (complimentary), non smoking rooms, air conditioning can be found in selected guestrooms. The hotel offers various recreational opportunities. Hotel Hardeo combines warm hospitality with a lovely ambiance to make your stay in Nagpur unforgettable. Stop at Hotel Siddhartha Inn to discover the wonders of Nagpur. The hotel has everything you need for a comfortable stay. Facilities like 24-hour front desk, luggage storage, valet parking, car park, room service are readily available for you to enjoy. Comfortable guestrooms ensure a good night's sleep with some rooms featuring facilities such as television LCD/plasma screen, internet access – wireless, internet access – wireless (complimentary), air conditioning, desk. The hotel offers various recreational opportunities. Discover all Nagpur has to offer by making Hotel Siddhartha Inn your base. The 2-star The Majestic Manor offers comfort and convenience whether you're on business or holiday in Nagpur. Featuring a complete list of amenities, guests will find their stay at the property a comfortable one. 24-hour front desk, luggage storage, room service, airport transfer, meeting facilities are on the list of things guests can enjoy. Guestrooms are designed to provide an optimal level of comfort with welcoming decor and some offering convenient amenities like air conditioning, desk, mini bar, telephone, fan. Recuperate from a full day of sightseeing in the comfort of your room or take advantage of the hotel's recreational facilities, including garden. Discover all Nagpur has to offer by making The Majestic Manor your base. Stop at Le Meridien Nagpur to discover the wonders of Nagpur. The hotel offers guests a range of services and amenities designed to provide comfort and convenience. Take advantage of the hotel's 24-hour room service, free Wi-Fi in all rooms, facilities for disabled guests, Wi-Fi in public areas, valet parking. Some of the well-appointed guestrooms feature locker, closet, complimentary tea, towels, clothes rack. Access to the hotel's hot tub, fitness center, sauna, outdoor pool, spa will further enhance your satisfying stay. Le Meridien Nagpur combines warm hospitality with a lovely ambiance to make your stay in Nagpur unforgettable. 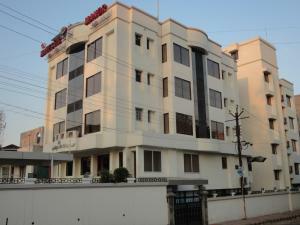 Hotel Dua Continental is conveniently located in the popular Mohan Nagar area. Featuring a complete list of amenities, guests will find their stay at the property a comfortable one. Facilities like Wi-Fi in public areas, valet parking, car park, room service, airport transfer are readily available for you to enjoy. Guestrooms are fitted with all the amenities you need for a good night's sleep. In some of the rooms, guests can find television LCD/plasma screen, internet access – wireless, air conditioning, desk, mini bar. The hotel offers various recreational opportunities. Friendly staff, great facilities and close proximity to all that Nagpur has to offer are three great reasons you should stay at Hotel Dua Continental. Set in a prime location of Nagpur, Peanut Hotel puts everything the city has to offer just outside your doorstep. The hotel offers guests a range of services and amenities designed to provide comfort and convenience. 24-hour room service, free Wi-Fi in all rooms, daily housekeeping, 24-hour front desk, Wi-Fi in public areas are there for guest's enjoyment. Television LCD/plasma screen, internet access – wireless, non smoking rooms, air conditioning, desk can be found in selected guestrooms. The hotel offers various recreational opportunities. Convenience and comfort makes Peanut Hotel the perfect choice for your stay in Nagpur. Stop at Hotel Royal Palace to discover the wonders of Nagpur. The hotel has everything you need for a comfortable stay. To be found at the hotel are 24-hour room service, Wi-Fi in public areas, car park, room service, airport transfer. Some of the well-appointed guestrooms feature air conditioning. Entertain the hotel's recreational facilities, including outdoor pool. Discover all Nagpur has to offer by making Hotel Royal Palace your base. Set in a prime location of Nagpur, Radisson Blu Hotel Nagpur puts everything the city has to offer just outside your doorstep. Offering a variety of facilities and services, the hotel provides all you need for a good night's sleep. To be found at the hotel are 24-hour room service, free Wi-Fi in all rooms, 24-hour security, ticket service, taxi service. Television LCD/plasma screen, linens, mirror, towels, internet access – wireless can be found in selected guestrooms. The hotel's peaceful atmosphere extends to its recreational facilities which include fitness center, sauna, outdoor pool, spa, massage. Radisson Blu Hotel Nagpur is an excellent choice from which to explore Nagpur or to simply relax and rejuvenate.